For DIY windows there is no shortage of companies prepared to sell windows and doors to homeowners who prefer to install them as a diy windows project. Suppliers carry no risk of measuring, surveying or installing the diy windows correctly and since most companies would insist on payment upfront for supply only transactions, they won’t suffer from bad debts either. The other side of this is that there are plenty of risks for the homeowner to install their own windows and you should only do it if you are capable of the installation and you consider the cost saving to be worthwhile. However, there is a definite saving to be made with diy windows (about 30% to 50% should be achievable) and you may know someone who works for a PVCu window installation company who can fit them for you at weekends. DIY Windows – A Local PVCu Window Manufacturer or the Internet? There will obviously be a larger choice of companies to deal with if you search the internet for suppliers of DIY windows than there will be in your local area and there may be reputable companies from both sources. You can probably expect lower prices from companies which only sell over the internet but that could be at the expense of poorer service. When measuring for new diy windows your chosen PVCu window manufacturer will require the final manufacturing sizes and that’s not just the external brick to brick dimensions. A fitting tolerance of 5mm to 10 mm all around the frame is generally required and care must be taken when there is a thick plaster line or tiled internal reveals. PVCu add-ons may be required to the sides or top of the new window or door where the plaster line is thicker than the outer frame. This is particularly common for doors so that the hinges on the new PVCu door does not snag on the plaster. Also, don’t assume that the brickwork allows for a perfectly square or rectangular window – it may be wider at the top than the bottom for example. When ordering new DIY windows, check with your manufacturer whether they want internal or external views for the designs. A side opening window which opens the wrong way wouldn’t be satisfactory. Replacing your home’s windows is subject to Building Regulation approval and avoiding compliance can only lead to problems at a later date. 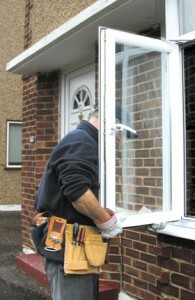 Paying a FENSA registered company to install them is the simplest way of dealing with compliance with Building Regulations but if you are installing the windows and doors yourself you will need to deal with the local Building Control Department – and there will be fees and possibly an inspection of the work. Finally, although it may seem obvious, new PVCu windows bought for a DIY windows project will only carry the manufacturer’s guarantee, there will be no guarantee on the installation. If you, or a friend who installs the windows make a mistake on the installation, you will have to put it right yourself…..and that may require a new insulating glass sealed unit or another new PVCu window.